Personal reaction to the book: It’s not pretty cynical for a teen book, it’s pretty cynical (as in Raymond Chandler’s “Red wind,” where the pearls from the dead lover are fake). Even I, cynical former newspaper guy, would like to see some potential shred of redemption for Jerry Renault. Otherwise it’s a crisply written, psychologically worthwhile look at bullies and bullying, well before its time. Read this and If the witness lied back-to-back and you get the whole range of philosophy, from this is the best of all possible worlds to life is solitary, poor, nasty, brutish and short. Aside from hoping there would be some crumb of hope for Jerry at the end, I liked this book quite a bit. Author facts: Robert Cormier was raised, lived, worked and died in northwestern Massachusetts. He was a newspaperman for decades. 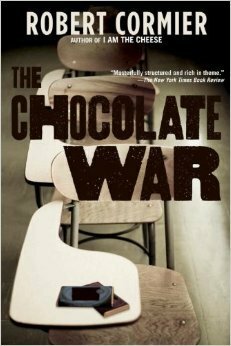 Cormier went to parochial school, the setting of The chocolate war.